Paul Auster’s 4 3 2 1 was the best written, most fun books I’ve read in many a year. The books listed here are entirely based on the personal opinions of LibraryThing staff members. I encourage you to take a look at our page on How Authors Can Use LibraryThing for helpful tips and links. If you have any further questions, please email us at info@librarything.com and we’ll be happy to help you from there. Loved every one of these! So hard to pick just 5! None of Us the Same and Truly Are the Free by Jeffrey K. Walker. These first 2 of a trilogy set in WWI and the 1920s take you to Newfoundland, Ireland, France, Harlem and more through vivid characters and beautiful writing that puts you right in the stories. All the Missing Girls by Megan Miranda is a compelling mystery told backwards. These three rank on the top of my list for 2017. – Hillary was her own worst enemy. – An amazing year for an amazing band. – Another great microhistory from a guy who knows how to write it. – The first trip around the moon was a real shocker, and a real accomplishment. – An older one, but a really comprehensive look at popular music since the beginning of recording. Really good. 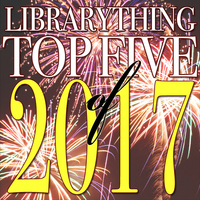 I’m wondering about books 576-598 listed in the reader’s 5 best books of 2017. How did they get on the list when there is no one listed who selected them? I’m watching the postings and hope to see more. I added mine a few days ago as reluctanttechie. There’s a typo in the “Top News” module announcing this: “See staff pick’s on the blog”.